It’s time to let go of the mentality that skipping meals, cutting out whole food groups, and drastically cutting calories is the magic potion to weight loss. The reality is when we do this, our body goes into starvation mode holding onto anything it can, especially fat, for fear we won’t eat again. Not only does this cause our metabolism to plummet, but it often leads to intense sugar cravings and zaps us of every ounce of energy we may have. Unable to suppress the undeniable cravings and pangs of hunger, most of us will crack with little to no regards for what we are eating or how much we are eating. Our bodies can only process so much food at once, so anything beyond what we need gets stored as fat for fear we will again go into starvation mode. Not to mention overeating usually gives us that overly full and guilty feeling often causing us to skip meals, go back into starvation mode, then crack and overeat again. To learn more about this check out my philosophy. The good news is there is an easy, simple, realistic solution to this viscous cycle! It’s called “eating in 3’s.” Simply put, this means eating every 3-4 hours with the right balance of the 3 essential macronutrients: protein, fat, and carbs. Doing this allows our bodies to use the fuel it needs from the food we eat, release our stored fat for additional energy, protect and build our lean muscle tissue, and eliminate those stubborn cravings and hunger pangs. 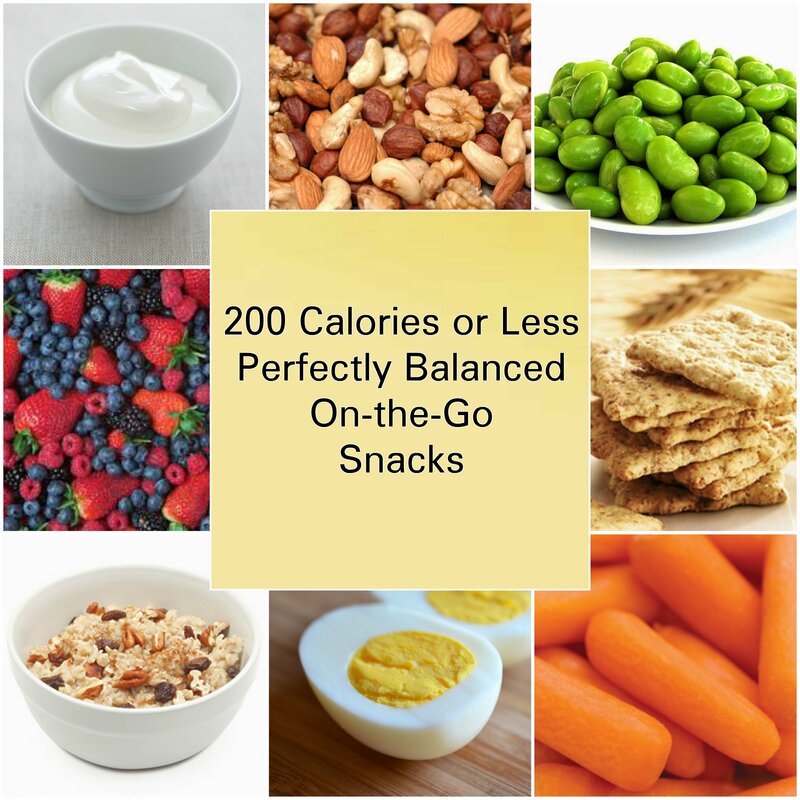 Since most of us claim we are too busy to eat a mid-morning and mid-afternoon snack or that’s it’s simply too much work to come up with the right thing to eat, I have provided you with some of my favorite 200 calorie or less on-the-go snacks that contain the right balance of protein, fat, and carbohydrates to stabilize your blood sugar, rev your metabolism, eliminate your cravings, and increase your energy for your entire day.